Are you looking for a complete course in teaching English as a foreign language which takes you effortlessly from beginner to confident teacher? Whether you are starting from scratch, or are just out of practice, Teach English as a Foreign Language will guarantee success! Now fully updated to make your language teaching experience fun and interactive. You can still rely on the benefits of a top language teacher and our years of teaching experience, but now with added features within the course and online. Chapter 20: Lesson planning 4 - what would you do if...? Extra online articles to give you a richer understanding of the subject. Very clear methodology, some repetitions but I guess that derives from the the author's oral teaching experience, more based on this than writing/reading. I bought this for my kindle app and it never downloaded properly. No matter how many times i tried, i got an error message. I just bought this for my Kindle and the download was smooth, unlike the experience of another reviewer. I decided to buy the Kindle version because I really liked the 'first' edition(2001) of the book. 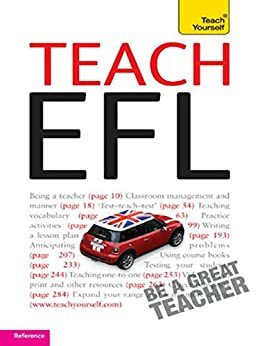 The book has a lot of great information on teaching EFL, but the Kindle edition(2012) has not been updated. Except for the introduction, this 'new' edition is practically a word-for-word replica of the first edition. Therefore, if you have the first edition, you don't need to purchase the Kindle version.